Research in the Mehrkhodavandi group focuses on catalysis. We seek to discover molecular structure and reactivity that can contribute to interdisciplinary solutions for environmental challenges in both fundamental and applied studies. The lab focuses on rational catalyst design using synthetic inorganic and organometallic chemistry, polymer synthesis, and extensive mechanistic studies. We place a great emphasis on the applicability of our research and have active collaborations with industry partners to develop biodegradable polymers of interest in medicine and materials. The interests of the group encompass the areas of synthetic and catalytic organometallics chemistry, with a special focus on control of chirality and electronics via rational ligand design. In one major part of the project, we are developing Lewis acidic metal centres supported by chiral ligands for the controlled ring opening polymerization of cyclic lactones to form biodegradable polyesters. 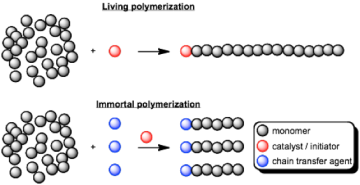 Fig 1. Ring opening polymerization of lactide catalyzed by a dinuclear catalyst. Both metal centres are involved in propagation. We reported the first chiral indium salen catalyst that displays a remarkable combination of high activity and isoselectivity for the polymerization of racemic lactide. This is in contrast to chiral aluminum salen complexes, which are more selective yet suffer from low activity. Based on preliminary kinetics studies, this system shows a high degree of enantiomorphic site control derived from ligand chirality, resulting in the formation of stereoblock PLLA-b-PDLA with significant crystallinity. Fig 2. Chiral indium salen complexes are highly active, isoselective catalysts for the ring opening polymerization of racemic lactide. Preliminary kinetic investigations confirm enantiomorphic site control as the dominant contributor to selectivity and formation of block copolymers. The ethoxy-bridged dinuclear indium catalyst can used for the ring opening polymerization of the cyclic ester beta-butyrolactone (BBL) to form the biodegradable polyester poly(hydroxybutyrate) (PHB). The catalyst shows remarkable activity and control during polymerization, allowing for formation of diblock polymers. Addition of high ratios of alcohols to the catalyst leads to fast chain transfer and immortal polymerization of lactide as well as BBL. Fig 3. Living vs. immortal polymerization. 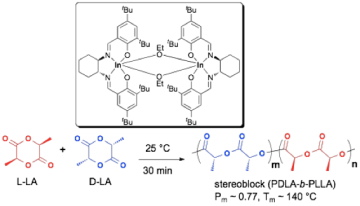 the Chain transfer agent can be another polymer such as poly(ethylene glycol), leading to biodegradable amphiphilic diblock polymers.